The Harmattan haze can become so dense in Dakar, Senegal, it dims the sun and grounds flights. The view from the house where the author stays in Accra, Ghana. 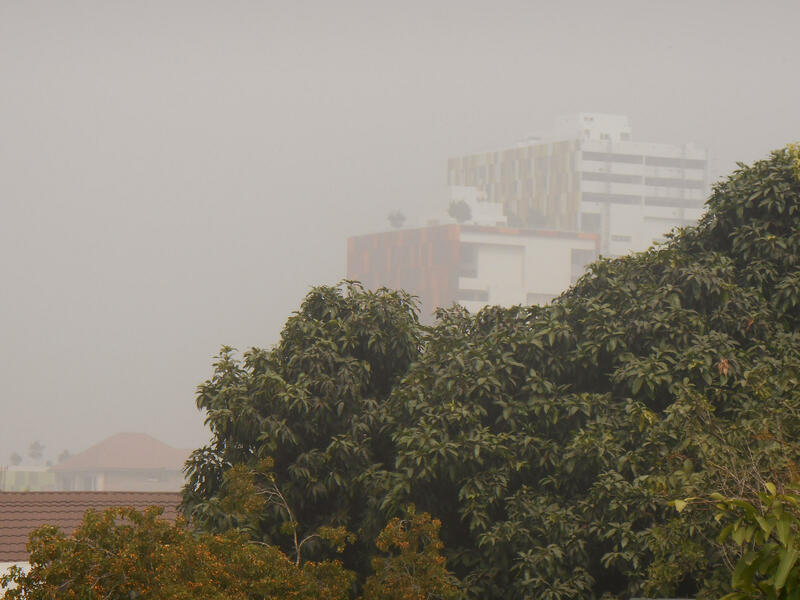 The buildings in the background are typically bright green and red, but a blanket of Harmattan haze has dulled their colors. You know that saying about an ill wind? Well, that ill wind is the Harmattan. Seasonal sandy, dust-filled, hot trade winds blow in from the Sahara Desert and sweep across West Africa, including the coastal curve, and directly down my throat and into my lungs and increasingly constricted chest. OK, OK. That may not be a scientific assessment, but that's how it feels, so please indulge me. The Harmattan — a land wind — blows from the northeast and often starts in January (the cool season). It sometimes continues through to March, though winds come and go without much notice. There's a Harmattan haze hovering over downtown Dakar that looks all too familiar. The malevolent mantle of dust and sand, that's threatening to settle, comes after gusty, dusty weather, with winds whistling through the streets of the city center. It usually carries large amounts of dust, which it transports hundreds of miles out over the Atlantic Ocean. The dust often interferes with aircraft operations and settles on the decks of ships. The same dust-laden winds that blanketed Accra when I was back home in Ghana last month — and where I fell ill — seem to have followed me across West Africa to Senegal, where majestic and mighty baobab trees and palm trees are sprinkled with a layer of dust. Pedestrians are covering their mouths and noses with scarves and shawls for protection. And fast food motorbike delivery riders are wearing mouth masks. Some days, visibility was limited to about 150 yards in Accra, and then the haze would lift and, psychologically, you would feel a little better. When I was a child, I remember being told "children get sick during the Harmattan season," so take care and don't be ill. This year it's not only children. On plane journeys, on the street, just about everywhere, I seem to hear adults and kids coughing, like the relentless cough I just couldn't shake. I'm so sure this lingering seasonal Harmattan, which descends on us, then disappears, is one of the causes of these lurgies. A Dakar-based pulmonologist told me asthma sufferers get worse during the Harmattan; wheezing, whistling and rattling even more than usual. Keep that pump handy. And surely it can't be a coincidence that chest and throat infections seem to be on the rise? Must be all that germ-filled dust we're gobbling up. But the Harmattan winds are not only a risk to humans and health. Agriculture is also feeling the effect; regional cocoa trees are suffering. (Yes, the cocoa that produces the chocolate you crave.). The cocoa crop in Africa's two top exporters, Ivory Coast and Ghana, has been hit by the Harmattan, we're told. Farmers and analysts warn that the worst Harmattan winds in several years may lower output and cut production. As the seasonal gusts blow down from the Sahara, they blanket the cocoa-growing regions in dust, which lowers temperatures and blocks out sunlight. In Ivory Coast, blossoms and small pods that were visible this time last year are apparently missing from the cocoa trees this season. 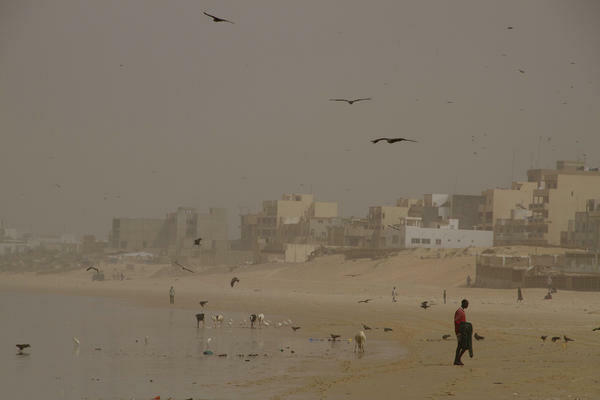 And here in Dakar, usually bright blue skies have turned horrid and hazy, with an almost yellowy tinge. So that's why I'm feeling rather miffed, because I was hoping we were finished with the Harmattan this year. But the ill-wind looks as if it wants to pester us a little longer. I read somewhere that the rather lyrical name "Harmattan" originates from the Akan-Twi word haramata, which could possibly come from the Arabic haram, meaning "evil thing." Evil works for me. Begone!